The Economic Benefits of Marijuana - Should Liberia Explore the Sector? 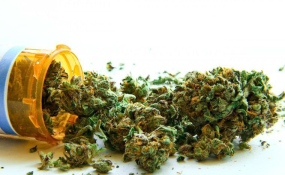 Reports from Liberia's consular office in New York, quoting reliable sources, say some United States based pharmaceutical companies have expressed interest in establishing a pharmaceutical plant in Liberia to produce medicines from the marijuana plant. Speaking to the Daily Observer under condition of anonymity, a local health official noted that there is a general perception that the large percentage of mentally challenged individuals parading the streets of Monrovia, including "Zogos" are drug addicts. He said while this may be true, it is however questionable whether such addiction is actually from marijuana use or the use of hard drugs such as, heroin, codeine, traumadol and cocaine, especially crack cocaine commonly called "dugee." Meanwhile, a noted economist (name withheld) has told the Daily Observer in an interview that, based on his observations, Liberia is losing millions of dollars each year to an underground network of marijuana smugglers and middlemen which, he said, is not good for the country. The economist, quoting reports from Mordor Intelligence, said, "there is also an increasing use of marijuana as a functional food, with purported health benefits far outnumbering what consumers can get from kale, turmeric, or kombucha". The report further adds "with the new generation growing up in the United States, where cannabis is legal, new products are found rapidly entering the market, which is expected to grow rapidly over the forecast period. The growth of the market is also attributed to factors such as the trends of producing edible products with cannabis in selected countries. Therefore, marijuana is expected to be included in the 2018 food trends as the drug and its ingredients have been gradually making their way into the public market. Doctors also prescribe medical marijuana to treat muscle spasms caused by multiple sclerosis, nausea, poor appetite, and weight loss, caused by chronic illness, such as HIV, nerve pain, and Crohn's disease. Thus, with the increasing applications, there is a huge opportunity for marijuana for medicinal purposes as well according to the report. As per the scope of the report, "medical marijuana refers to the whole, unprocessed marijuana plant, or its basic extracts, for the treatment of several diseases and other related symptoms. Scientific studies show that chemical cannabinoids could help treat a range of diseases and symptoms, which has attracted several biopharmaceutical companies, globally, over the past two decades. The market is expected to witness significant growth, owing to legalization in several countries and high demand for both medical and recreational purposes" the report concluded.